BEACON FALLS — The town of Beacon Falls and Region 16 Board of Education have taken opposing stances when it comes to an easement on the Woodland Regional High School property. The easement is an overgrown path off of Rimmon Hill Road. It’s used by local residents, particularly equestrians, to cut through the school property between the athletic fields to get to Matthies Park, which borders the school land. 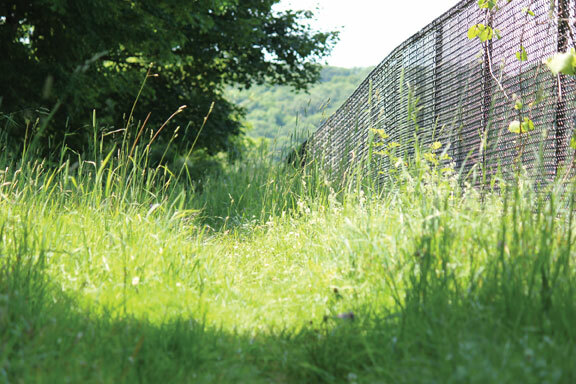 The school board, which oversees schools in Beacon Falls and Prospect, is considering blocking access to the easement at the recommendation of its legal counsel. School officials have expressed concerns over the risk of additional liability due to people traversing its land. Attorney N. Warren Hess III, the board’s counsel, gave his opinion on the matter in a letter sent in January. In the letter, Hess wrote Region 16 would be assuming additional liability if it allowed anyone to pass through the property by horseback or any other means. “My recommendation is to not allow anyone to pass through Region property by horseback or otherwise. If the board wants to consider the granting of rights to the general public and not accept my recommendation, at a minimum you must contact your insurance advisor for additional input,” Hess wrote. The town, on the other hand, contends land records give the legal right for residents to pass through the easement. “From our standpoint, it seems very clear that the town of Beacon Falls retains the legal passage,” First Selectmen Christopher Bielik said. The easement is used frequently by horseback riders to get to Matthies Park, equestrian and resident Mary Ellen Fernandes said. Fernandes, who grew up on Rimmon Hill Road, said she’s been riding through the easement for years and well before Region 16 bought the land. She currently keeps her horse at the Hagen property on Rimmon Hill Road, she said, as do several other equestrians. “There’s more horses in town than people realize,” Fernandes said. Fernandes said passing through Woodland is a much safer option to get to Matthies Park. She said riding on the road poses a danger to horseback riders as well as people driving. Bielik concurred, saying if equestrians are forced to ride on the road to get to the park it’s a public safety issue. Fernandes is also a member of the Parks and Recreation Commission. From the view point of a commissioner, Fernandes said she doesn’t want to see anything that restricts access to town parks. “I don’t think anyone in town should be limiting access to a town park,” she said. Region 16 Superintendent of Schools Tim James said the board is taking a subjective approach to the matter and relying on the advice of Hess. He said the board has insurance to cover an incident if someone gets hurt on school property. However, he said, the contour of the land where the easement is is different than the rest of the property. Someone traversing the property through the easement could open the board up to increased liability — particularity if it knows the situation could be an issue. James said the board isn’t just looking at equestrians, but also has to consider someone using the easement in other means, like on a snowmobile or ATV. “The board also needs to protect itself,” James said. School board Chair Donna Cullen said the board is not trying to upset anyone and is looking at the matter as a potential safety issue as well. “The board wants to do what is best for the Region and the community, and we also have to listen to the advice of our attorney,” Cullen said. The easement issue first came up late last summer after a landscaper working at the school put up a fence blocking it. The fence, which was subsequently taken down, led horseback riders to question school officials as to why it was put up in the first place. That was when many on the board learned that equestrians passed through the property. At the time, the board also felt horses passing through the school could present a health issue as members of the cross country team have to dodge manure during practice, according to officials. A contingency of local horseback riders presented its case to the board last November. Resident and horseback rider Patricia Hinman was among those who spoke to the board. In an interview this week, Hinman said those who ride through the property clean up after themselves. She added there are no shoulders along the roads in the area, which makes traveling by road dangerous for equestrians. Hinman, who turns 76 this year, has been involved in equestrian activities for most of her life. She moved to town in 1968 and along with her husband started the Beacon Falls Ridgerunners 4H Horse Club. These days, Hinman rides purely for recreation and physical therapy. “We just want to be left alone to do what we’re allowed to do,” Hinman said. As equestrians presented their case, the board in turn sought the legal advice of Hess. Although Hess’ letter was received in January, the matter was pushed to the background by more pressing issues — such as the bond for security improvements and the 2014-15 budget. The matter was set to come up again earlier this month. The agenda for the board’s June 11 meeting listed an item for discussion and possible action on the easement. Diane Ciano from the Connecticut Horse Council addressed the board at the meeting on behalf of two members of the council’s horse patrol from Beacon Falls. She said members of the patrol work with the state to maintain trials across Connecticut. “The local equestrians concern is retaining that access to that easement,” Ciano told the board. Ultimately, the board tabled the item on the easement due to a letter from the town’s land use attorney, Steven Byrne. The letter was forwarded to the board by Bielik. In the letter, Byrne requested a copy of Hess’ legal opinion to review and asked that the board take no action on the matter at the meeting. “You should know that if the board does take action to block the use of the easement in anyway, appropriate action, including an injunction, will be taken,” Byrne wrote. Bielik said the letter was sent to the board because town officials knew it was on the agenda, but didn’t know the board’s intentions. “We took the steps that were necessary in order to reserve the rights the town has,” Bielik said. The board discussed Byrne’s letter in executive session. No action was taken following executive session. The two attorneys were asked the review the matter and discuss their opinions, according to officials. The easement was not included on the board’s agenda for Wednesday’s meeting, which was after press time. The easement appears in land records for the property, but each side interrupts its meaning differently. The easement dates back to a deed from 1938 when the land was conveyed from Milton Carrington to the Seymour Trust Co. The deed references a strip of land, about 20 feet wide. “Also conveying a right of way to pass and repass for general purposes on foot, horseback with vehicle over and through other lands of the said grantor along a convenient and agreed location …” the deed reads. Subsequent deeds all refer back to this deed, including the land record from 1999 when the town sold the land to Region 16. The deed references a right of way over a 20-foot-wide strip of land set forth in a 1956 deed from Carrington to Adele Gomberwicz. The 1956 deed refers back to the one in 1938. Those who want the easement to remain open point to the deeds as stating clear intent that the easement is available for residents to use. “It seems pretty clear to us that the town retains a 20-foot easement through the property,” Bielik said. However, Hess offers a different opinion. In his letter to the school board, Hess states the easement is an “appurtenant easement.” “An appurtenant easement provides an owner with additional rights on other land of the grantor and is a benefit to the parcel. An appurtenant easement does not burden a parcel of land by the granting of rights to pass through the subject parcel by third parties or the grantor, in this case, Milton Carrington,” Hess wrote. Hess wrote the Seymour Trust Co. obtained absolute ownership of the land in 1938 plus the additional right to pass over other land owned by Carrington. No one obtained any rights to pass through the land purchased by Region 16, he continued. This additional right to pass through other land owned by Carrington is currently held by Region 16, the letter states. The easement is currently open, as the matter remains up in the air. Both sides are hoping for an amiable solution. “We just want it straightened out, so we’re able to ride without worry,” Hinman said. James said the board is hoping for a solution that is fair to each side. “You’d like to hope that this comes to some resolution that could be fair to both,” James said. This was not the Park & Rec document I referenced, but as noted, it shows the Old Road as an access point into the park. The other document is a history of Bernard Matthies and the Park property that was used to nominate the Summer House on the Island for recognition in the State Register of Historic Places. I was commissioned by Park & Rec through a third party. I have never done research on the Old Road other than the map I mention. The school property stops at the stone wall that borders the baseball field. There is a ~20 foot piece of land between that wall and the stone wall that borders the McGeever Farm. Does the Town own this? Assumed but unknown at this time. I see, and stand corrected as far as your suggestion — no red herring. If it proves true and becomes a viable access point for the horses to the Park from that location then the issue could be resolved safely, which is what I think everyone is interested in. Stand on Rimmon Hill Road at the end of the Carrington house driveway and look along the Mcgeever Farm stone wall looking towards the park. The property is clear of trees up to the point where the trees begin. you will notice a gap that is the old road. I am not trying to tie horses to any part of the old deed and I see no red herrings here. I am also suggesting that additional research is needed to validate possible intent for one or both locations. I am merely suggesting that the easement from 1938 may be the old road and not the area that is now owned by Region 16. One way to possibly resolve this is to review several 1930’s photographs in the possession of Park & Rec. They show a worn path that snakes through the field in the area that is now the baseball/softball fields. My memory does fail me here as I do not remember if the path links to the old road or to the area you are supporting. Horses would not have been part of the 2002 conversation, as there was no controversy regarding them at the time. However, the language of the deed may have had an impact on the decision to allow pedestrians to enter from the side — there would have been equal concern for liability back then and Mr. Stowell was the business manager for many years — during the time when plans for the high school were developed if I am correct — he would have been in a position to be most familiar with the intention of the easement. But, that is just a theory of course. I understand you are attempting to tie language about horses in the deed to another area. As is Mr. Hess, if I read him correctly — he indicates that the deed is referring to passage across some other (unknown) land? An unusual interpretation. These positions would need supporting documentation, otherwise they come across as red herrings. I am curious about the old Abandoned Road you speak of — from where can be seen on Rimmon Hill Road? I spoke with two people this weekend who have been using the easement in the photo for years — seems it’s been in use for well over 50 years — and there was an understanding that the strip of land was a passageway that was grandfathered into the land. The town seems to support that position, as does the deed. If there was a different area it referred to, I think it would have been known by locals. If it proves true that the deed refers to another area and has been a misunderstanding all along, then that information should have been considered at the time of the land sale so that the public could have spoken and safe passage to the park by equestrians would be addressed before the transfer of the land. It’s not fair, or safe to impose new expectations at this point. Sorry for the typo. 2002 conversation. My memory is fine, thank you for asking. What I remember is that the 2009 conversation was about access to the track, not creating a bridge to trails in Matthies Park. There was never a conversation between the Board of Education, the building committee, and town officials that horses or any local farmers will need access. Region #16 is a stand alone public entity and the land is not the property of the Town of Beacon Falls. My comments here have been directed towards an attempt to tie language about an easement in the 1938 deed to the current location being discussed. I do not believe they are the same and I do not think my school tax dollars should be spent maintaining a public horse trail. Should it be confirmed that the Town still owns the Old Road, I would consider supporting reopening that area as another public access point into the park. The question of locals using the easement pictured in the article to go through the side gate for access to the track was answered in 2002, by Bill Stowell when you were on the BOD. Perhaps some details will refresh your memory. There was discussion in 2002 about keeping the gate from the track to the road open, but the board had decided to lock it because someone had driven across the track and people were parking along the road near the track, which was a saftey issue. Being a runner, I was following this and asked a question some time after the gate to the road was locked. In fact, I believe it was you I spoke with — I explained that once one entered the gate from the easement, the inner gate of the track closest to that entry was sometimes locked. I asked if it could be left open so we did not have to walk all the way around, but the answer was that it was not up to the BOE, but the coaches. While I do not expect you to remember such things with granular detail after 12 years, I do remember them because being able to walk to the track from our neighborhood was a new found delight and access on foot was important to many of us. People have been using this access for years without incident and the BOE was not only aware of it, they had granted permission to use it with that response. Mr. Stowell would have done due diligence on land usage before responding, which is why he, not the BOE was called upon to answer the question. Whether there was a cornfield there before, equestrians have been using the easement for decades. There is even a horse crossing sign on the road shortly before the easement. I do not think the town would have transferred the land to region 16 without considering the impact on long-time Beacon Falls farmers and boarding stables, as shutting off access to a trail would devalue thier businesses. Additionally, this was not simply commercial or private property — it was Park property, originally bequethed by a foundation with intentions that seem to be clearly stated in the deed as including passage for horses. @new-voice/@jd06403 – not sure about what you two are “discussing’ but until someone clarifies where the easement that is referenced in the 1938 deed is actually located, access across this piece of land you are discussing is a question. There was a open field, sometimes planted with corn, in this location prior to Region #16 owning the property. There was no ‘identified’ 20-foot wide path in this area. I again say that the Old Colonial Road, which is approximately a 20-foot wide strip that ran from Rimmon Hill Road into the Park and over towards Chestnut Hill Road in Oxford, is the easementin the 1938 deed. You can still see the roadway when standing on Rimmon Hill Road. There is at lease one map at Town Hall in the Map Books (book #1?) that shows this road. It is labeled ‘Abandoned Road’ . It makes more sense that this is the easement that would have been negotiated in 1938. It was a path that already existed. @jd06403 From what you have written, it seems you are not familiar with this area or how the facilities – recreational fields or the park – are actually used by local residents (inclusive of students, adults and equestrians). Much of Rimmon Hill Road, heading towards the easement from West Street is a reasonable place to walk or bike with care for a teenager or an adult, as would be a typical residential road in town. After passing the easement and the Beagle Club (where spillover parking for football games takes place), there is a hill and a sharp curve. This is the area that people or horses would be “forced” (your words) to transverse to get to the entry ways of both the school and park if the easement would be closed. Currently, with the easement open they are far safer crossing the grassy area and staying off the road. The concern pertains to people on foot, bike or horse riders, not necessarily those with access to vehicles. Entering public land to use public facilities is not trespassing. When the gate to the jogging tracks were locked many years ago for safety concerns (including parking on the road), I had conversations with members of the board about the fact that there was still access to the fields from that area — the open gate was missed, but as long as we could access the fields from the easement that was fine. They have been aware for years that locals enter from that spot to walk, run, play tennis and otherwise enjoy the facilities. I hope that decisions can be made with genuine concern based on how people actually use the area rather than sanctimonious finger-wagging, overbearing opinions about how others should access public spaces, self-serving exaggerations, or partisan political alignments. As far as neighbors crossing our property — I don’t mind at all! It happens all the time as there are circumstances when it simply makes sense. @new-voice. Thank you for your clarification. So, my question remains, why are parents allowing their children to run wild over Rimmon Road if it is so dangerous? You have expanded your list to now include “others”. What others? If it is so dangerous to be on this road, then shouldn’t this access be closed for the very safety reasons you are worried about and force people to use the school parking lot if they want to use the track? Enabling people by leaving the area open is asking for an accident. Both the Town and School would probably be sued in this case as they know there is a problem with both the road and leaving the access open. I am not sure where you live, but is it okay with you that someone crosses your property unannounced? There is a Park Entrance, why not encourage people to use that instead of trespassing (subjective to this discussion over easement rights) to go to the park? If you had read my post carefully, you would have noticed that this is not a discussion about walking to school. Students and other people access the school property and park for recreation after school and on the weekends. The jogging track is open to the general public when not used by teams for example. The road up till the easement has clear sight lines, but if the easement were blocked, people would have to continue over a blind hill and curve to access the property. Use of the easement keeps people, including students, off that particular dangerous stretch of road. Restricting access without offering a viable alternative puts people at risk. My point was the safety issue extends well beyond a few equestrians and does impact students amongst others living in the area. I thought Region 16 has a bus every student policy? Why are students walking to school on a dangerous road? But wait New-Voice – why are students going to the park and not school? Where are the parents of these students? Do they know their children are walking on this road if it is so dangerous? New-Voice, your argument has many holes in it. This is not just about horses. Of course everyone has rights to the road, but unfortunately that particular stretch of road is extremely dangerous. If this easement is blocked, there are numerous Region 16 students living nearby who use it regularly for passage to the park and fields — this is not insignificant and should be given appropriate attention from people with common sense and who care. Anyone voting on this would be well informed by visiting the area and walking that blind hill and curve before deciding that our community would be better served by sending students or anyone else down that road instead of on a grassy path. This is the strip of land pointed to that’s being used to get through the school. It is between the football field and the neighboring property. We’ll be during another story on it when the issue comes up again/is resolved and will ask about whether this was an easement built during construction of the school. In attorney Hess’ letter to the board he wrote the exact location of the easement is difficult to locate for many reasons including an indecipherable word in the original deed. “The vagueness of the easement location is not a concern to Region 16 unless the Region is seeking the right to pass through other land of Carrington from Rimmon Road to an uncertain location. In my opinion, this additional right is of no practical benefit to the Region, and additional research into the location of the easement would be very expensive and is not necessary,” he wrote. Question on the photo provided with this article. It appears to be a view along the south end of the football field. As I remember the easements granted during construction of the high school, this area was a ‘new’ easement granted to the Town & utilities as access to the land that separates the school & Matthies Park on the west property line. Seems that the easement being argued in this story is not located by the football field, but is located on the Old Colonial Road (called Abandoned Road on Town maps and referenced as the Old Road in the Bernard Matthies document commissioned by the Beacon Falls Park & Recreation Department). This old road is a twenty foot wide strip of land that is on the West side of the Carrington House that ran from Rimmon Hill Road down into the park along what is now the South side of the Baseball Field. Old maps indicate that there was a small intersection (triangle) that today is just part of the Carrington house driveway. This needs to be validated before Region 16 opens itself to increased liability by allowing access to its facilities. I agree with the Region that this access needs to be restricted. Even if it is proven that the location implied in the article is the easement granted from the 1930’s, this does not give rights to the general public to access the property. I would assume that this is a Utility Easement. This was granted solely to allow a Town or Utility access to what is otherwise considered land-locked property. Even with the easement in place, the Town or Utility must notify the property owner of it intention to exercise the easement on a given time period. It is not an open door that can be used at will. Horses and their riders like joggers, bicycles, and anyone in a vehicle all have rights to the road as defined as by traffic laws. Region 16 has enough issues to resolve and should not have to worry about horses as well.